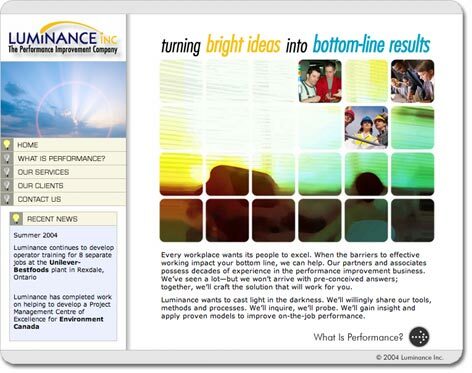 Luminance Inc. is a consulting company specializing in improving on-the-job performance. They wanted a web site that featured a clean, uncluttered design and intuitive interface. They also wanted the site to reflect the theme of illumination, or bringing light into the workplace. The site we designed is easy to navigate and presents information in a clear, organized way. Click here to visit the site. "Kenneth Young Design helped guide us through a multitude of functional and aesthetic possibilities for our corporate website. Their design skills, sense of style and technical prowess were apparent throughout the project. We now have a site we feel enormously proud of-and it is a joy to invite clients to visit it." Alan Calvo, Vice-President, Luminance Inc. If you would like to get a free quote on a website for your business, please don't hesitate to contact us. Many "web design" companies will produce a site that looks okay, but might actually have issues that diminish its impact or effectiveness. At Kenneth Young Design, we're familiar with all of the characteristics required to make a successful website. For example, we ensure that the site loads in an approrpriate time frame. This means that images and multimedia elements are optimized for the perfect balance between size and quality. We design intuitive navigation systems that ensure users can find the information they need quickly. And before a site is deemed "completed", we ensure that it is compatible with all browsers, across multiple platforms.